In this post, you will learn about how to implement Google Recaptcha with Angular and Spring/Java App. The Signup form with Google Recaptcha would look like following. The working example can be found on this signup page. 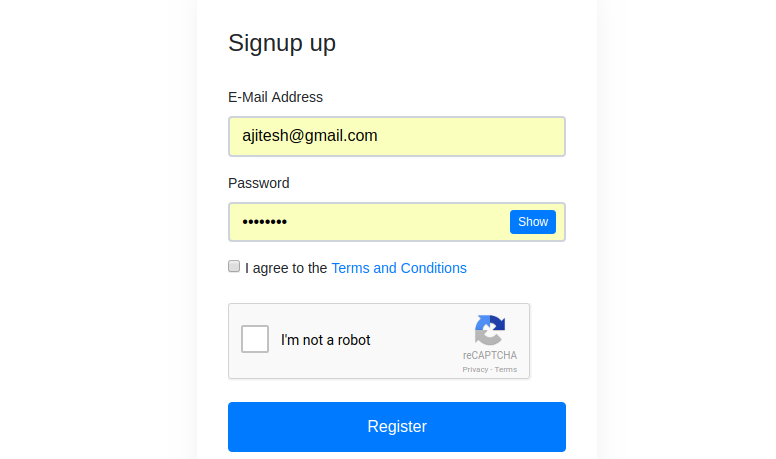 Process the code in Login/Sign up component such that unless the user has clicked on Google Recaptcha, they should not be allowed to proceed further. Pay attention to the code such as grecaptcha.getResponse() and the check related to the length of response. Google googleRecaptchaSecretKey is autowired. You may want to take the value of RecaptchaSecretKey from Google Recaptcha Website and place it in application.properties file and read it as one of the Configuration bean. The following is the sample code for application file and configuration bean. A RestClient is used autowired. You can create a simple RestClient using Spring RestTemplate. The following code can be used to verify the Recaptcha response which arrives in the request message. In this post, you learned about how to implement Google Recaptcha in your Angular and Spring/Java app.